Cook the spaghetti in a pot of boiling water for 8-10 minutes or until fully cooked. Drain and rinse in cold water. In a large frying pan or wok, heat the vegetable oil over high heat. Sauté the onion and carrot for 2-3 minutes. Add the cabbage and garlic; stir-fry for 1 additional minute. Add the shrimp and sauté until fully cooked. Reduce to low heat. While the shrimp is cooking, in a bowl mix the chicken broth, soy sauce, white vinegar, sugar, cornstarch and ground ginger. Combine the soy sauce mix, shrimp and drained spaghetti, and cook in 1 pan for 5 minutes over low heat until the sauce has thickened. Remove from heat. To serve, sprinkle with red pepper flakes, to taste. Enjoy! If you don’t have white vinegar, use the vinegar from canned jalapeño peppers. When we first arrived in Mexico some 15 years ago there were no Chinese restaurants in our small town. It was an unpleasant experience for us, since we loved eating Chinese at least once a month, sometimes even once a week. Since our craving couldn’t be satisfied, I decided to learn how to make our favorite Asian meals at home, which was much easier than I had imagined. Nowadays, there are various high-quality Chinese restaurants in town. 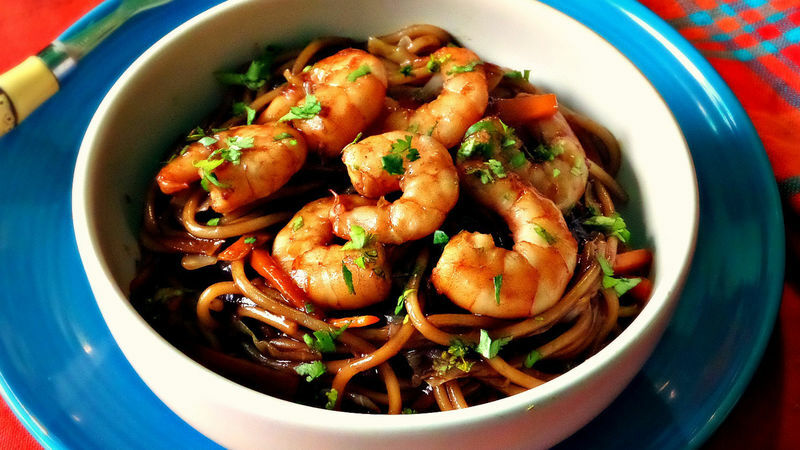 While we can get delivery anytime, I’m still preparing dishes like this shrimp chow mein at home, not only because it’s super easy to tackle homemade, but also because you’d swear by the flavor that it was whipped up in a restaurant. Prepare this chow mein recipe today for your family; they won’t believe you made it yourself!